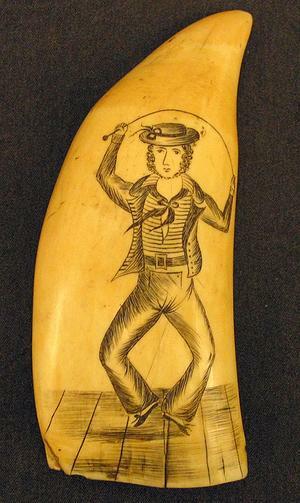 Scrimshaw is a type of art that involves carving into the bones and teeth of sperm whales. It became an extremely popular craft on whaling ships between 1745-1759. 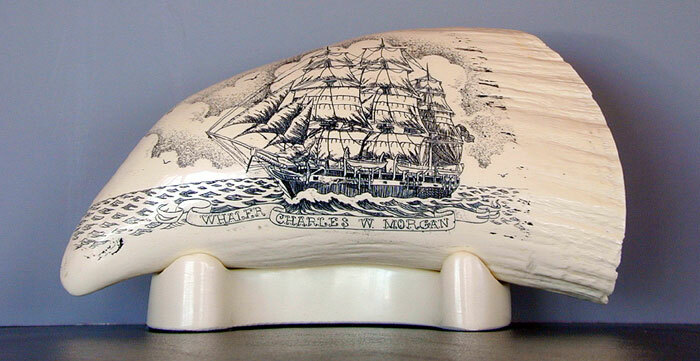 Whalers continued to create scrimshaw until the ban on commercial whaling in 1986. The people who worked on the whaling ships would spend the days hunting for whales and their nights leisurely working on a scrimshaw. The whale tooth or bone was engraved using a sailing needle and then rubbed with soot to darken the drawing. This art form was popular when there were so many sperm whales in the ocean nobody could imagine them becoming extinct. Now...scrimshaw is only practiced as a hobby and all teeth, bone, and ivory (from elephants) are almost impossible to come by in order to protect the animals. There was no way I couldn't post "Star Wars" by artist Noel Green....but this one was carved into a piece of legally obtained ivory NOT whale tooth.